↑ "Curry: Where did it come from?". Retrieved 17 December 2014. ↑ Peters-Jones, Michelle. 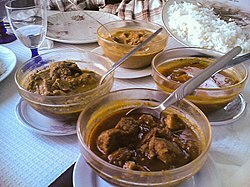 "Indian Classics - Vindalho de Galinha (Chicken Vindaloo)". The Tiffin Box. Retrieved 13 July 2015.